A collection of photographs featuring people. 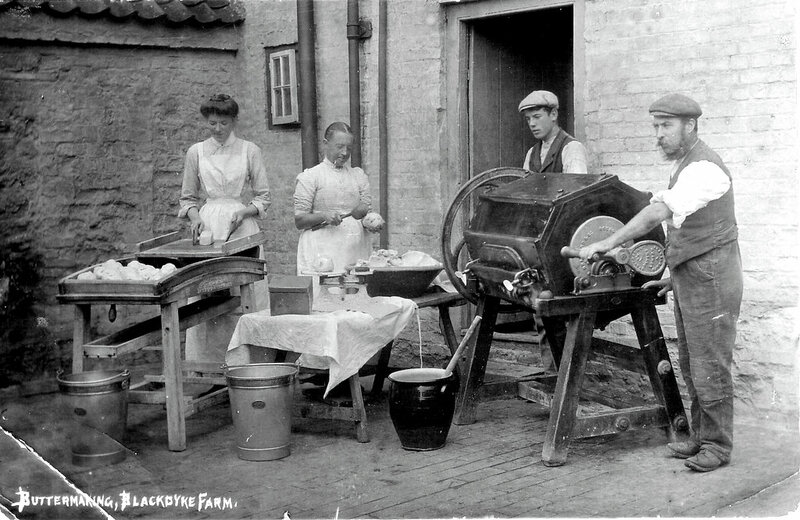 Billy Vincent Butter making at Blackdyke farm The dung cart Jack Porter Mr W. J. Court, harness maker. 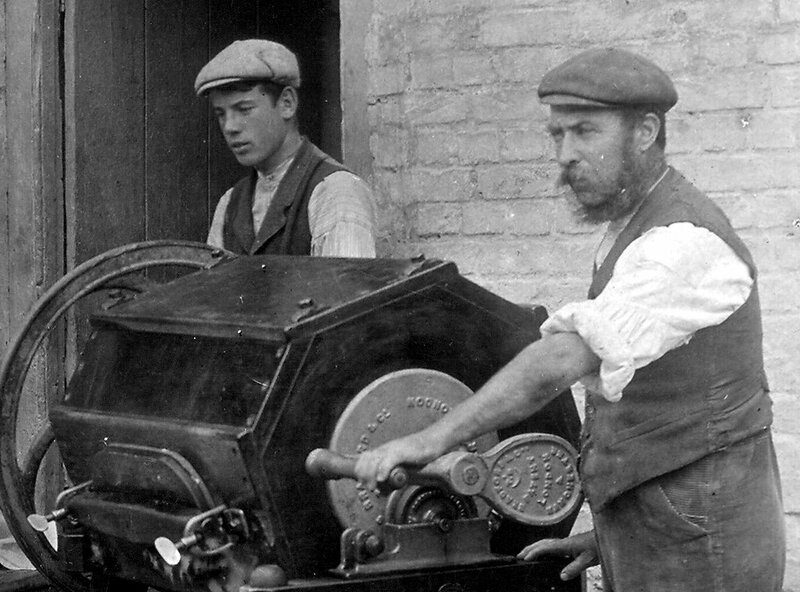 Feltwell Workmen. Mr Pryer unloading turf. 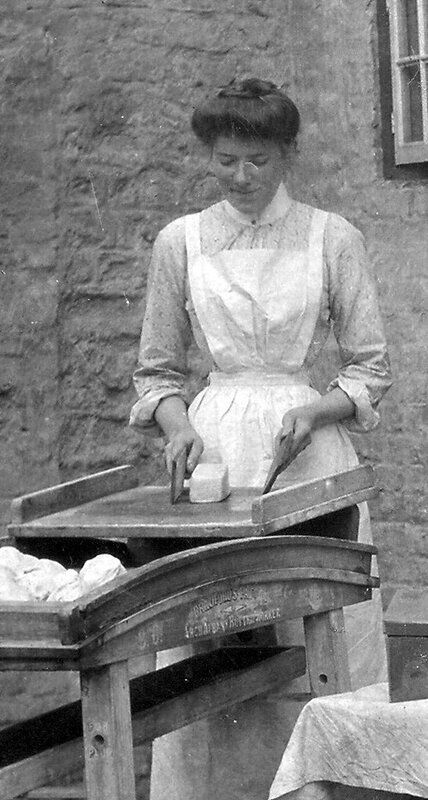 Probably Violet Gent (nee Tilling), little girl unknown. Violet's husband Percy was Head gardener at Hall. Filling sandbags. The lorry of Frank W.Fincham, haulier of building materials and sugar beet. Photo from Mr Gerald Harrison (grandson) Mr Chris Walker (1950's) with Betsy, the last working pony in Feltwell. Used to do 12 miles a day as Mr Walker farmed at Schrubhill before the Min. of Ag. moved in. On Mondays the pony did a 20 mile round trip to Methwold market. The farm house is behind Rose Villas (Roseneath) cottages. Bertie Ralph Howlett. Taken at back of the Chequers. Provided by Pearl Mann (nee Howlett) Erecting flood defences - 1912# Robert Howlett at Commerce House Shop, Short Beck. Cecil Jacobs. He was a gamekeeper as well as a shopkeeper. Possibly the ferry crossing over the Ouse at Feltwell Anchor. Note the tow path on the left. Probably taken at Ashtons. Grandfather Bertie Rafe Howlett. Read the article about his retirement. Cecil Jacobs doing his daily deliveries from the shop in Bell Street.